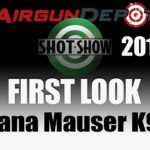 SHOT show 2019 I’m in the Diana booth giving you a first look at the new Mauser K98 made by Diana. Now this is a PCP, comes in .177, .22, or .25, it’s got a shrouded barrel and it’s built to look like a Mauser K98. Really cool, really light. Handles well. A bold action, you’ve got a single shot tray or you’ll get two or youll be able to use the magazines. We’re like, we don’t have a firm price on it, somewhere under $350, and we’re expecting to be out in the springtime. So stay tuned for more SHOT show coverage.